DD5LP/P – November 18th. 2017 3rd. 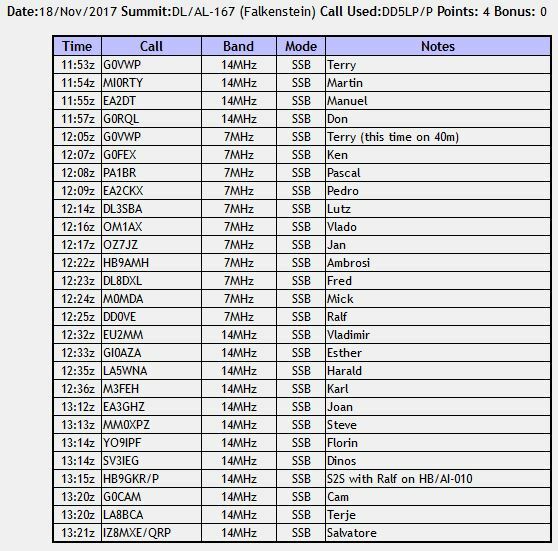 annual EU-NA S2S event – DL/AL-167 Falkenstein. The third annual, NA – EU/UK S2S event, was set for this date a couple of months ago, before we could know how either weather or radio conditions would be. My initial plan was to make this interesting for chasers by activating DM/BW-064 Heersberg, a 10 pointer south of Stuttgart and towards the French border. When it became obvious that the weather may be fairly bad and that with my nearly 3 hour drive each way, I could not be on the summit at the same time as the North American activators, I decided to change the summit and after looking around for one with at least a few points which didn’t need a lift for access (all mountain lifts in southern Germany close around November 5th. until just before Christmas for maintenance, upgrades and repairs before the Ski season starts) I settled on the 4 pointer DL/AL-167 Falkenstein which I have activated twice before, but not yet in 2017. After my tests with new antennas over the last few activations, I decided to take the new Lambdahalbe J-pole antenna for 20m with the 10m mast and the Komunica Bazoka Pro mobile whip on my tripod for 40 metres. The rest of the set-up would be my FT-817, and home-modified 25w amplifier. Falkenstein has the highest castle ruin in Germany on top of it at 1267m ASL summit. This castle was intended to become another of King Ludwig’s residences but his death under suspicious circumstances drowning in the Starnberg Lake occurred before the work on Falkenstein could commence. The mountain lies above the town of Pfronten, close to the Germany/Austria border. Access to the summit car park from where it’s about a 15 minute walk to the castle ruins and summit is via a one-way toll road. This road really is one-way with no passing points and sheer drops off the side of the road in places. Road use is controlled with lights and cars are allowed up the road (fee € 4) between quarter past the hour and 5 minutes before the full hour. Cars coming down are allowed on the road between the full hour and 10 minutes past. It takes about 5 minutes to drive up the windy narrow road. An expensive hotel is located about 30 vertical metres below the summit but access to that car park is restricted to hotel guests and the public car park is a further 40 vertical metres below that. So after parking, there is a relatively steep climb both up to the hotel car park and then on up a set of stone steps to the summit. Located near the hotel is a communications tower – which made itself know during the activation! Rules for use of road. The small hut where tickets are bought. The rules at the top of the road for decending. Once I arrived at the summit, or more accurately at the top platform within the ruins on the summit, I found the table still present that I remember from last time although moved into a corner (which was fine). There was still some packed snow on the wooden floor of the platform and ice on the table and it was… COLD! I first of all set up the 20m J-pole, winding it around the 10m mast as I raised it – the counterbalance 1/4 wavelength stub and feed coax ran nicely across to the table. Once that was up, putting up the tripod was simple and quick, the most time being needed to run out the counterpoise wire so that it wouldn’t be in the way of visitors who came up occasionally. The Komunica Bazoka Pro was then unpacked and the top element connected and the complete antenna screwed on to the SO-239 socket on the tripod. Once the rig and amplifier were unpacked and cabled up, the station was ready to go. I took my usual set of photos to document the (somewhat overcast) conditions. I started on 20 metres as this was the intention of the activation. Tuning around the band sounded good and not too busy. It was 11:53 UTC a little early for the other activators so I decided to make sure everything was working by making some chaser contacts and I was rewarded with contacts from the UK and Spain. When these calls ran out I decided to give 40m a try. As soon as I switched over antennas and band – I realised I was going to be in for a difficult time. The last time I activated Falkenstein I noted QRM from the radio tower at the side of the hotel. I had thought that had been VHF interference – wrong! This tower produces S8-S9 noise all across the whole of 40 metres (and presumably beyond). This of course meant any chasers calling me on 40m would need to be at least S8 and better S9+ before I could easily hear them. I pulled my headphones out of my rucksack and concentrated to pull the stations through the noise. I was very surprised that 11 contacts from some very patient chasers came in from all around Europe! It was now 12:30 (UTC) and as I had to be back at my car in time to drive down in the time window when the road was open, I would need to start packing up at 13:30 at the very latest. I switched back to the 20m antenna and looked for some of the now spotted other activators. There was no way that I would hear any of these it seemed as the LZ DX contest had started and the band was full of loud (and hence wide) stations – trying to hear a portable station through that noise would be difficult at the best of times but there was now another factor – QSB. Stations that came back to my CQ SOTA call were varying in strength 3-4 S-points (and I presume they were hearing the same thing with my signal). After a while I took a break and took down and packed away the 40m antenna to reduce the time I would need later to pack up. I also realised that the battery in the amplifier was almost drained and so attached my external battery ready for some more 20m contacts. Eight more contacts followed including one S2S with Ralf HB9GKR on HB/AI-010 – I believe this must have been a ground wave contact. My several attempts to call Sylvia OE5YYN/P came to nought, I was obviously too weak a signal – Sylvia was at best 3-3 with me so I was not surprised that my signal (which would have been a ground wave contact again) didn’t get through. At 13:30 UTC it was time to pull down and pack up the 20m antenna and mast and pack all equipment away into my small rucksack and photo bag and head down to the car – where I arrived about 5 minutes before the hour and was the first through the lights to head down the mountain and then knock 15 minutes off the time I had needed driving there, arriving home just before a heavy storm came over. Komunica Bazoka Pro loaded Mobile antenna (40m). Hama camera tripod (modified with SO-239 socket) and counterpoise. Band conditions were marginal at best on 20m and when the contest stations came on they flattened what SOTA stations that were on. I think I was lucky to get the number of contacts that I did on the day. On 40 metres that S8-S9 interference from the communications tower right across the band made things REALLY difficult and the headphones certainly came into their own on this activation! Both antennas worked well in the conditions and the Bazoka Pro certainly sets up very quickly. It’s a shame it doesn’t perform as well on 20m as it does on 40m (it’s supposed to be a wideband 40-10m antenna). The schedule of the one-way road closing meant that I had to leave quite early to get home before it got too dark. If I had been able to stay longer I still don’t think I would have achieved a North American S2S this year in any case.